Bakun is located on the Balui River in the upper Rejang River basin, 37 km upstream from Belaga town in the state of Sarawak. The project was conceived to support the Malaysia Government’s Fuel Diversification Policy, and it is a renewable and clean source of energy. It will significantly contribute to meeting the increasing demand of electricity in the country. 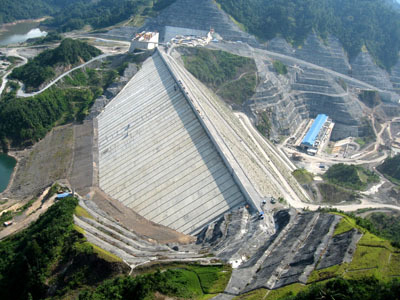 Sarawak Hidro Sdn Bhd, a wholly-owned subsidiary of the Ministry of Finance Incorporated Malaysia, was entrusted to develop and manage the Bakun Hydroelectric Project on 1 May 2000. The Company’s vision is to be a cost-effective and environmentally-friendly energy producer; providing cheap, reliable and clean electricity for the State of Sarawak. The Company’s mission is to ensure the successful development and completion of the Bakun Hydroelectric Project located in the upper river basin of the longest river in Malaysia, the magnificent Rajang River. The project is scheduled for completion in August 2011. The storage reservoir with a surface area 695 km2 at its full supply level of 228 metres above sea level has started its impoundment since 13 October 2011 and currently the water level has reached 191m, barely 4 meter more is required to reach the minimum level for commercial operation. The Bakun Power Plant has an installed power generation capacity of 2400 MW with 8 turbines. It is equipped with the latest technology control and protection systems. 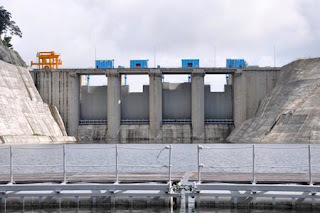 With plentiful of rainfall in the catchment and huge reservoir storage of 44 000 MCM, the Bakun Power Plant will have a firm generating capacity of more than 1 773 MW. Once fully operational, it will be the main power supplier of Sarawak State, providing energy especially for the development of the ambitious SCORE Project (Sarawak Corridor of Renewable Energy). As a responsible company, Sarawak Hidro Sdn Bhd also carried out a 2 year programme on animal and plant rescue from the flooded area, the first of its kind in Malaysia. As of 31 march 2011, nearly 1000 animals have been rescued while over 13 000 seedlings have been replaced. The company has not forgotten the downstream people affected by the dam, since 2009, Sarawak Hidro Sdn Bhd has embarked extensively on Company Social Responsibility Programmers and has spent over a million ringgit installing new gravity water systems or improving existing systems for 4 boarding schools and 24 longhouses in Belaga District, improving boat jetties for the 4 schools and assistance in other aspects.